Office 365 users are being notified that Outlook is now adding events to calendar automatically. I think my main objection with this is that my emails are being reviewed for content, plus I like to choose what I schedule. 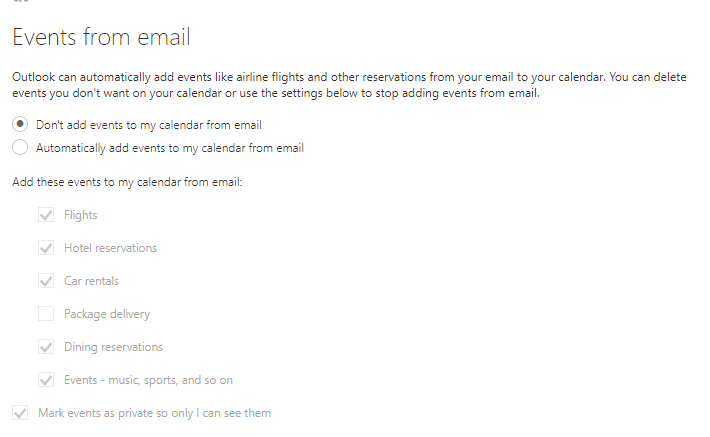 Outlook will now automatically add your flights and other events from your email to your calendar so you don’t forget them. This feature is enabled at the Office 365 side, not the Outlook side. You’ll need to login to your email account at https://login.microsoftonline.com. Once logged in, select Outlook if you aren’t already there. The change happens immediately and you now have control over your Inbox, and Calendar again. Be the first to comment on "Turn Off Outlook Adding Events To Calendar Automatically"